My portable SSB/CW receiver is based upon a ready-made MW receiver. These pocket radios can be modified for the 160m band by adding a product detector and some dexterous tuning. This project is a top band (160m) superhet receiver with an IF of 455kHz. Construction is made easy by the use of a chip which includes an AGC controlled RF amplifier followed by a balanced mixer fed by an on-chip oscillator. 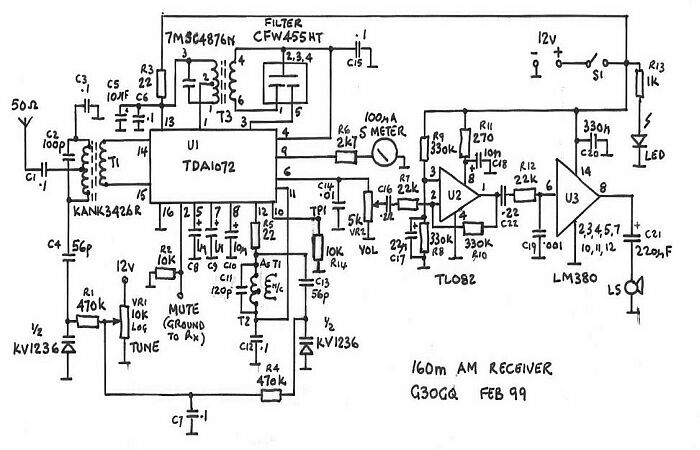 Whilst looking through my lab book I came accross this little receiver circuit. It looks like "kid's stuff" but it can be used for the lower HF bands and gives quite an impressive account of itself if used with a decent antenna.